What a way to stand up for life! The New York bookstore, Jon Speed: The Book Scout closed on Wednesday, Jan. 23, after Gov. 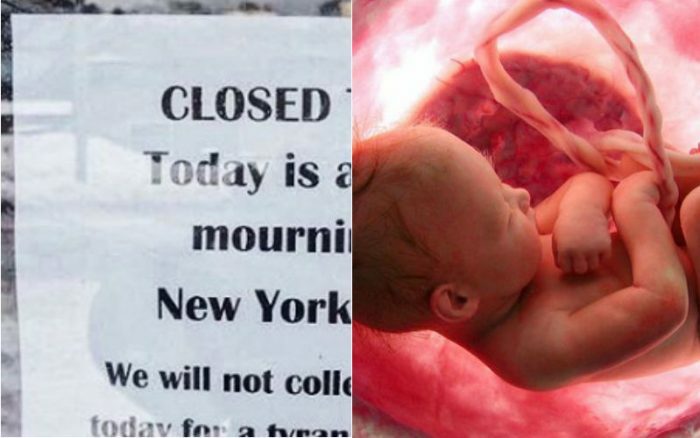 Andrew Cuomo signed the law allowing abortions up until birth. The sign reads, “CLOSED TODAY. / Today is a is a day of mourning in New York State. 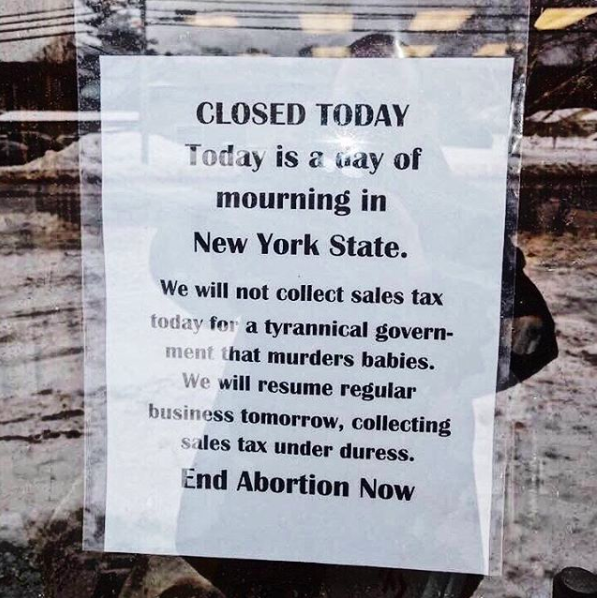 / We will not collect sales tax today for a tyrannical government that murders babies. / We will resume regular business tomorrow, collecting sales tax under duress. / End Abortion Now”. The bookstore also announced this on their Facebook page. The bookstore has received an overwhelming positive response regarding the closure. Several social media users expressed their thoughts of the post, both on Instagram and Twitter. This twitter user had an interesting comparison between New York Gov. 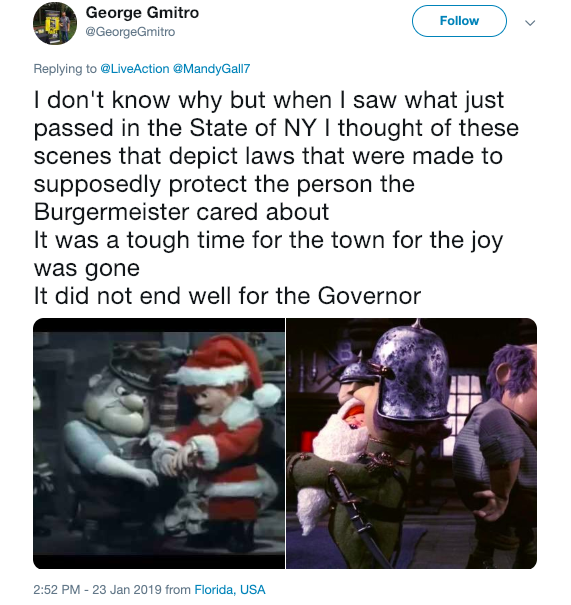 Cuomo and the Governor in the movie “Santa Claus is Comin’ to Town”. Another user said, “God bless them!!! If they have a website and online purchasing I’ll buy something 2 times a month to support them!!! standing up for babies is a win for me!! #JohnSpeed”. A few days after their sign went viral on social media, the bookstore said their sales skyrocketed. They’ve also been invited to speak tonight on on Bott Radio Network with the Family Research Council. The text reads, “We want to thank you for your overwhelming support and notes of encouragement. We have tried to respond to as many as we can but cannot get to them all. “We are surprised at the number of online orders that have been placed and will work diligently to fill them over the next couple of days. Please be patient as we sort through the emails and fill the orders. 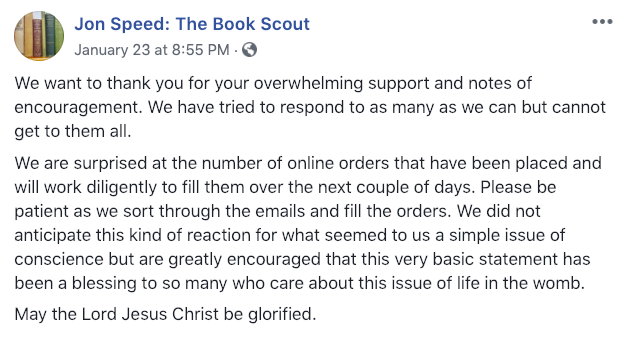 “We did not anticipate this kind of reaction for what seemed to us a simple issue of conscience but are greatly encouraged that this very basic statement has been a blessing to so many who care about this issue of life in the womb. Let us all pray to end abortion now!